I read this latest Quarterly Essay while The Spouse drove home from the Annual Shelmerdine Art and Wine Lunch in Tooboorac organised by my Alumni Association, and so I was perhaps feeling more relaxed about its subject matter than might be expected. I have never taken the slightest interest in American politics except to feel a mild sense of resentment that we in The Rest of the World have to put up with the results without ever having any opportunity to vote. But the prospect of Trump winning the forthcoming election is so appalling that I have made an effort to understand how it could have come about. 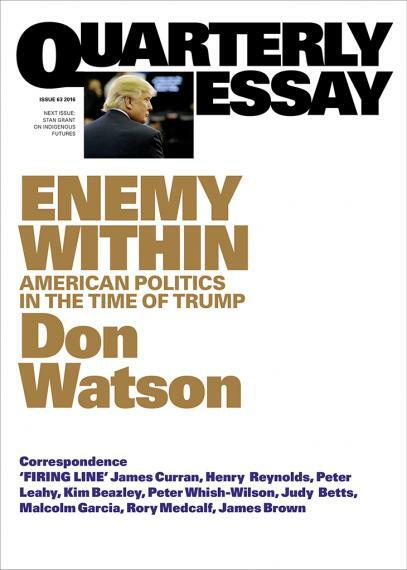 Despite the broad scope and intelligent analysis in Don Watson’s essay Enemy Within, American politics in the time of Trump I get the feeling that at heart he is as mystified as the rest of us. Travelling about in the MidWest, from civilised places like the University of Wisconsin where progressive thinking is the norm to Bible-bashing places where they are against family planning, Watson tries to make sense of the mindset that underlies American exceptionalism. He says, and I believe him, that Americans do not realise how low they have sunk in international measures of equity. The statistics he quotes about child poverty and people dying because they don’t have health insurance are all the more shocking because America is so rich. And yet they seem to believe that acknowledging these social problems is disloyal and that progressive strategies will impact on their cherished ‘freedom’. They don’t seem to understand, he says, that there are other countries in the world that have as much freedom as they do, and a better standard of living for their people. Watson goes into some detail about how the losers from globalisation find Trump appealing because of his simplistic promises, not unlike the way Australian losers voted in the last election for a racist party that offers nothing but a blame game. The difference is in the numbers. Huge numbers of people are supporting Trump, and the support is not localised as it is here in Australia. You can read an excerpt at Black Inc, and you can hear an interview with the author at ABC Radio National. Update (the next day): Janine at The Resident Judge of Port Phillip has reviewed this essay too, and she has also reviewed Watson’s previous book called American Journeys (which is languishing on my TBR). Available from Black Inc including as an eBook, and from Fishpond: Enemy Within: American Politics in the Time of Trump (Quarterly Essay), good bookshops and some newsagents. I remember standing in Southland almost in tears watching Obama’s inauguration and feeling so emotionally hopeful – who would have thought in our lifetime there’d be an African-American as President. I won’t feel that same sense of joy at Hilary being the first woman because of all the baggage she brings but it will be utter despair if Trump wins. How he even got this far says a lot about how angry people are at the unevenness of the economic recovery after the GFC and the power of his media machine and deep pockets. Who knows what will happen or how many people will even vote? And if Hilary wins will she honour any commitment to Sanders supporters about improving equity? Look how Congress and Wall Street stymied Obama. And then look at us – Abbott got back in although he was a dud PM and many of his supporters were re-elected too. I mean honestly how competent are George Christenson, Cory Bernardi, and Dutton? What kind of Australia would we have if the ultra-right got their way? How much will Malcolm negotiate away? I wonder how long the queue is to get on that flight to Mars? *chuckle* I hadn’t thought of Mars as an option! I was in the same year as Stephen Shelmerdine at Trinity. Not sure I ever spoke to him, though I think he and I were similar politically. That aside, I agree with everything Mairinealcreativewriter said, absolutely! I hope you’re following Mairi’s blog then … she writes stuff I know you would enjoy! The Shelmerdines are a lovely couple, and they make good wines too. We’ve been to their winery restaurant before and it’s a really nice day out. But politics didn’t come up, we were there to hear from the new director at the Castlemaine Art Museum and what it’s like to take over after a predecessor who’d been there literally for decades. Fascinating stuff! What’s happening re: Trump is exactly what happened here with Brexit. Disenfranchised people want an alternative to austerity politics which has downgraded their standard of living. They have been fed lies and propaganda about who to blame for this (immigrants!) and will vote for the person telling them what they want to hear. Of course, I’m simplifying, but when society becomes more and more polarised between the have nots and the have lots, and the (under resourced) mainstream media spreads sensationalism and propaganda, it spells disaster. When people aren’t given the information they need to make informed choices (or when they’re too lazy to do it themselves or simply don’t know how to), it’s easy for idiots like Trump to rise to power. I’ve been following his rise for the past 18 months or do. It’s scary but I understand how it happens. Look at Nazi Germany in the 1930s! Yes. And I agree that the media has a lot to answer for. What we are witnessing is the result of decades of dumbing down. The people who most need to understand what is being done to them would rather be entertained than invest some time and effort in reading and thinking about ideas that would genuinely improve their lot. If we think back to the Depression Years in Australia, there were Mechanics Institutes where working people who had no formal education could read books about economics and philosophy and discuss ideas in a sophisticated way. Those people rose to be leaders in politics and trade unions and they paved the way to C20th social reforms because they didn’t just know what they wanted, they knew how to achieve it. I don’t think there’s anything equivalent now.